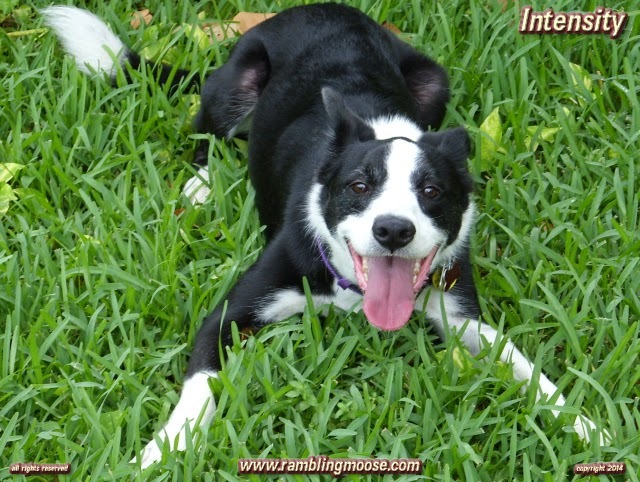 Rambling Moose: How Can One Marshmallow Create So Much Havoc For A Dog? How Can One Marshmallow Create So Much Havoc For A Dog? One of those moments of weakness. I had dinner. I had dessert. I had a glass of artificial crap sitting next to me waiting to be drunk. No, nothing all that bad. Just artificial diet pineapple soda. Artificial flavor, artificial color, smelled of pineapple and something else that was unrecognizeable. Really shouldn't drink that stuff. Really. Not good for you. All this was going through my mind as I padded into the kitchen with the empty glass. If I didn't there would be artificially colored, artificially flavored sludge in the bottom of the glass that would be disgusting by morning. Did I mention it kind of looked like something the dog would leave on the fire hydrant? Yeah, that. So I reached into the freezer for an ice cube and was going to add a little water to the glass. May as well have another drink. It had been a hot day for me. Looking down into the ice machine, since everything is "down" when you are as tall as I am, I spotted the bag in the bottom shelf of the freezer. Training tip to all those athletes in your life - keep the real junk food in the bottom shelf of the freezer or refrigerator. Out of sight, out of mind! It is a half eaten bag of marshmallows. They're in the freezer because it is humid in Florida even when the air conditioning is working well. Keeps them nice and fresh and they don't stick together. Plus an ice cold marshmallow is an interesting thing. Try it, if you don't like it, move the bag back onto the damn counter, okay? I walked out into the living room with the bag forgetting the glass on the counter for the moment. I hear "Hey! Marshmallows! Can I have One?" Yes, the One was Stressed. Just One. I tossed one at Kevin. Being generous I beaned him on the nose with a second one. It hit the floor. Rack had been watching. He comes over, sniffs the dropped sweet, grabs it and walks it over to his mat in the corner of the room. I place two more on the bar mat on the little table. Handing Kevin a second one, unwanted a second time, he thanked me saying "I know I said one, but these are still Good.". Yes, Good was Stressed. Simple pleasures. By the time I stowed the treats in the bottom of the freezer where treats belong and got back to the chair, the fun was beginning. Rack had been mouthing the cold treat and dropping it. I reached down to grab the marshmallow thinking he wasn't really all that interested, but I was wrong. He did the submissive dog thing. Kept it in his mouth and adjusted himself so that now he was facing the wall. Mouth, drop. Mouth, drop, chew. It was finally time for him to eat that little white puff. No, Marshmallows are not good for dogs, but they are only bad for them in the way that sweets should be strictly managed. He did go after his rawhide to brush the treat off his molars when he finished.
" I wonder if he was going to act like a kid high on sugar" was the second thought I had when I sat down. You know those kids in a mall you want to duct tape to their parents in hope that both of them will figure out that no, it really isn't acceptable to let your kids run wild in a public place, and yes, they are your problem to solve? Rack wasn't one ... yet. He settled down for a while before I noticed that he was starting. Being a Herding Breed what they do is to make sure order is maintained. Being a Herding Breed high on Sugar means the OCD kicks in on overdrive. First I noticed that he went over to the other side of the room. Grabbing his hedgehog toy, his current favorite, he came back to the mat next to me and was playing with it. Since we're trying to make sure that he's getting every chance to have confidence building exercises, I would take the coveted toy away and allow him to take it back. Normally all of this is a gentle and almost half hearted manner. Today, he pulled it out of my hands. Assertively. Interesting, sugar makes my passive dog assertive. We went back and forth for a while until one of us tired of this. Then he did the Herding Dog Pick And Place Robot Routine. They aren't called "Hoarder Collies" for nothing! I know, he's a McNab and not a Border Collie, but the personality has similarities. The next half hour was Rack grabbing toys and bringing them from one mat to the other like an industrial Pick and Place Robot. Back and forth. First the Hedgehog got the treatment. It went back to the first mat, then to the corner twice. Rack is prancing around the living room acting very excited the entire time. He climbed up onto me, melting into my lap, back feet on the floor. Repeated the same thing with Kevin. Then grabbing the hedgehog, he dropped it in my lap, and melted back onto me. I tossed the hedgehog over to the other mat while booping him in the nose once or twice. Rack pranced over to the hedgehog in three hops. It's a small room, I'm surprised he could fit those hops in. Placing the coveted hedgehog on the mat in the corner next to me, it was the rope's turn. Hop! Hop! Hop! He covered the distance easily. Circling the room with the rope, he knocked into Kevin's knee, climbed into his lap, wouldn't let the rope go when Kevin grasped it, then walked back into the corner with it and set it next to the hedgehog. Laying down for all of 15 seconds, he managed to place both toys on the opposite side of the mat, then neatly back where they belonged, directly below where my hand usually goes when I reach down to pet him. Springing up and HopHopHop across the room to grab the red rubber Kong bone. Sniffing it to see if anything was in it, it ended up next to the rope in a line, just out of reach. Hop Hop Hop, next came the nylabone followed by a tennis ball, followed by some other random toy that was in his toy stash. At this point some were under the rocker recliner I was sitting in stopping it from going all the way back. Toys were all now gathered, hoarded, and piled in the corner. He sat down. Mind you, most nights when we're watching some mindless TV programming, Rack just lays there, napping. He will wait until five minutes before we are ready to go for the dog walk and then start to gently herd us to walk him. Not tonight. Tonight, toys were being flipped in the air, paraded around the room, dropped on feet, and laps. He would melt into every lap available, pick the discarded toy up, march it into the Florida Room, the open bedroom, bathroom or what ever room was available. Yes, I had inadvertently given my dog sugar. It was acting like a stimulant, true to form, he was hyper. More like a black and white furry ball bouncing off of walls. When all the sudden, it stopped. Utterly. It was as if the clouds lifted and the din of a passing freight train had moved off away not to be heard from. Rack collapsed. Not with a sigh, but a roll onto his back. He was directly under my hand. Picking at my hand with one foot, I can't remember which, he guided my hand onto his belly. Bellies needed to be rubbed, this was one tired out dog. So the moral of the story is, while it is entertaining, your dog is best left without marshmallows. They're probably not the best for you either. But you will find all the toys dropped into one neat little pile as the energy gets burned off.